to manage the risks to health and safety associated with using, handling, generating and storing hazardous chemicals at a workplace. Preparing an emergency plan if the quantity of a class of hazardous chemical at a workplace exceeds the manifest quantity for that hazardous chemicals. Recovery Partners can provide consultancy on all these regulatory requirements with chemical management. • Risk assess a hazardous chemical and create a Safe Work procedure – we would do this as a tutorial with a nominated employee so direction can be continued in house to do the same with other high risk chemicals over a period of time. • Conduct a general site hazard identification process, enter all identified hazards (excluding individual chemicals) into a hazard register. Risk assess all identified hazards and create risk control action plans. The hazard register is a live document where you can emulate the processes we begin and use ongoing as other hazards are identified over a period of time. • Chemicals / Hazardous Substances Training Programs specifically developed and delivered to meet your operational needs. Prices are tailored. Contact us to receive a quote for your organisation. Need help with hazard identification? 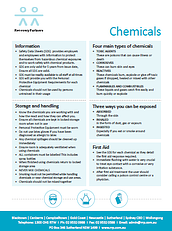 Download our FREE fact sheet detailing chemical hazards. Simply fill out the form below to download.